Grilled Veggies – easy and delicious! Fresh veggies are an easy and delicious side when you’re grilling. Nothing could be easier than popping on some peppers, egg plant or sweet corn to roast. Market Lady Theresa Dohm recently demonstrated a tasty grilling recipe at the Webb City Farmers Market. In a large ziplock bag add all the ingredients for the Grilled Marinated Mushrooms. Set aside for 5 – 10 minutes while you prepare the other vegetables. Using a piece of foil, make a tray for the grill by folding up the edges (make sure its large enough for all the veggies, or you can make 2 if its easier). Add the corn to the grill. Add the mushrooms to the grill. (reserve the marinade liquid for later use). Add the foil trays containing the onions and peppers to the grill. Grill until the veggies are ready – about 10 minutes for the peppers and onions, 15 – 20 minutes for the corn and 10- 15 minutes for the mushrooms) Remove the veggies from the grill and set aside. 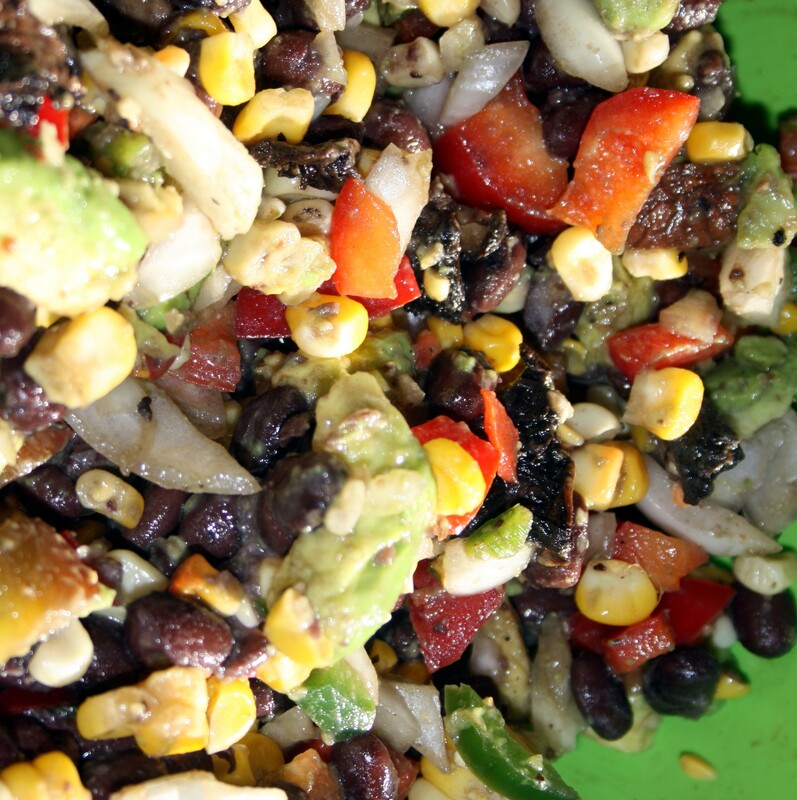 In a large bowl add the black beans and avocado. Pour in the reserved marinade liquid from the mushrooms. Add the peppers and onions. Cut the corn off the cob and add it. Dice the mushrooms and add those to the bowl. Serve and enjoy! !